With an mistakably Celtic Christian cross embossed into soft, leather feel olive shade covers, this compact size ESV Bible slips easily and comfortable into your bag or brief case. This is a Bible intended to go where you go rather than leave at home, encouraging you to take your Bible reading with you on journeys, business trips, holidays or just about your daily work. Double column layout makes for shorter easy, to follow lines when reading in cramped spaces, on the move or just away from the comforts of home and your main Bible. The text is printed in a clear 8-point size font – larger than the usual 6pt size for most compacts but less than the greater than 10pts of heavier and less protable editions you can find in Eden’s choice of ESV large print, larger size Bibles. Strong Smyth-Sewn binding is right for a Bible you carry around. Not only does it overcome the problem of glued-spine Bibles that fall shut losing your place, it lies flatter on your table, desk, lectern or lap making it easier to follow and setting your hands free. Durable yet soft covers make this Bible easy to carry and while gilded edge pages add to its quality appeal and make an attractive, well received gift. A Bible word concordance and practical ribbon place marker enhance this Bibles usability. A handsome Bible in the readable, word for word translation transition and with a King James heritage, The English Standard Version in this compact, larger print format provides a gift opportunity that encourages Bible reading for those about o make a journey, leave home or begin a new phase of life. The ESV® Bible (English Standard Version®) is an “essentially literal” translation of the Bible in contemporary English. The ESV Bible emphasizes "word-for-word" accuracy, literary excellence, and depth of meaning. The ESV is ideally suited for personal reading, for public worship, for in-depth study, and for Scripture memorization. The ESV Bible is available in more than 200 print editions, and it is free online anytime everywhere in the world. ESV Large Print Compact Bible: Olive Celtic Cross, TruTone Cover was published by Crossway in January 2013 and is our 10266th best seller. 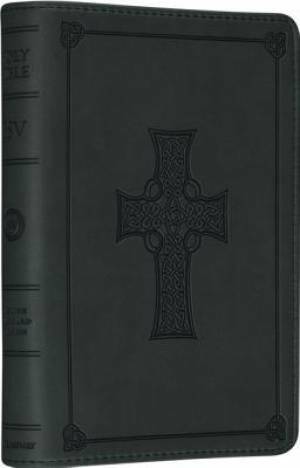 The ISBN for ESV Large Print Compact Bible: Olive Celtic Cross, TruTone Cover is 9781433535598. Be the first to review ESV Large Print Compact Bible: Olive Celtic Cross, TruTone Cover! Got a question? No problem! Just click here to ask us about ESV Large Print Compact Bible: Olive Celtic Cross, TruTone Cover. A:The measurements of this Bible are: Depth - 36 mm Height - 165 mm Width - 114 mm and the text size is Point 8. Thank you for using the Q&A Forum. The new ESV Large Print Compact Bible combines the benefits of a compact format with the easy readability of larger text. This Bible's 8-point type set in a double-column format gives the Large Print Compact the right balance between portability and usability. Bible readers of all ages will find this the perfect edition for travel and on-the-go reading.